If you want to protect yourself and your family from attack without having to possess a firearm, you may be considering owning a stun gun, taser gun or pepper spray. Each of these are permitted in the state of Ohio, provided they are used for self-defense purposes only. If you carry a stun gun, taser gun or pepper spray with the intent to use it as an offensive deadly weapon, you can face imprisonment and/or a fine. Stun guns, taser guns and pepper sprays are legal to buy, carry and use in Ohio as long as your intention is self-defense. Ohio's gun laws don't regulate the sale of stun guns or taser guns, which are readily available online and can be bought at retail shops in Ohio with no background check or limits on ownership. Under stun gun laws in Ohio, most people can buy, carry openly or concealed, or use a stun gun for self-defense without obtaining a permit. It is illegal in Ohio to carry a stun gun for purposes other than self-defense. It is also illegal to carry a stun gun, whether openly or concealed, in a school safety zone or a child-care center. The terms stun gun and taser are often used interchangeably, but they have major differences. A stun gun requires direct contact with an attacker, while a taser gun can be used from a distance. However, both are classed as electronic shock devices, and as such are permitted in Ohio. In Ohio, it is a first-degree misdemeanor to carry a concealed stun gun in public if the intent is to use it as a deadly weapon. Penalties include a fine of up to $1,000, up to six months in jail or both. Carrying a stun gun openly or concealed in a school safety zone or courthouse is a fifth-degree felony, and penalties include a fine of up to $2,500, between six and 12 months in jail, or both. In Ohio, there are no restrictions on the sale or possession of pepper spray, which causes intense burning and temporary blindness when directed at a person's eyes. Typically sold in keychain-sized canisters that require the pressing of a button to administer the spray, pepper spray is legal to carry in Ohio, provided it is for self-defense purposes. Pepper spray may be carried openly or concealed and is not considered a dangerous weapon under Ohio law. Gillespie, Claire. "Stun Gun Laws in Ohio." 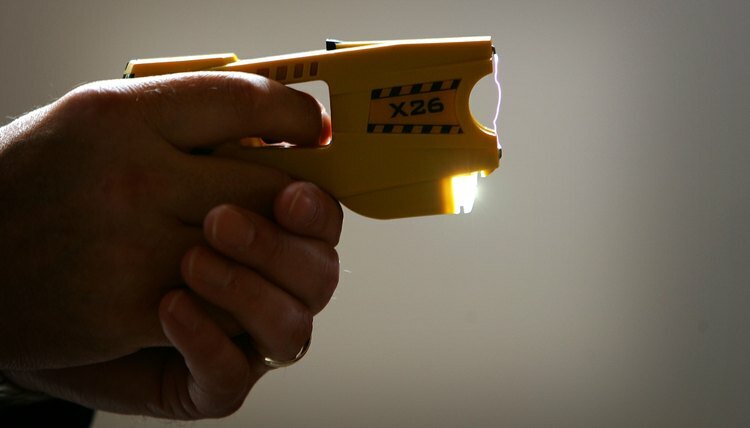 , https://legalbeagle.com/6192455-stun-gun-laws-ohio.html. 23 July 2018.